Eighth Avenue facade looking northeast, left, and 40th Street elevation, right. 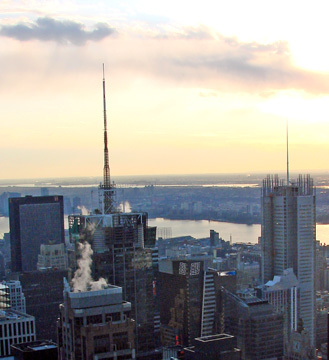 A joint venture of The New York Times Company, Forest City Ratner Companies and ING Real Estate, a wholly owned subsidiary of the ING Group unveiled its plan December 13, 2001, to erect a 52-story tower across Eighth Avenue from the Port Authority of New York & New Jersey Bus Terminal. The new building will occupy the east blockfront on the avenue between 40th and 41st Street. The bus terminal extends from 40th to 42nd Streets. When completed in 2006, the building will become the second most important building to be erected on the avenue after World War II. The most important building is World Wide Plaza on the former full-block site of Madison Square Garden between Eighth and Ninth Avenues and 49th and 50th Streets, which was developed by William Zeckendorf Jr. and World Wide Equities and which was an extremely significant contributor to the renaissance of the Midtown West district and Times Square. 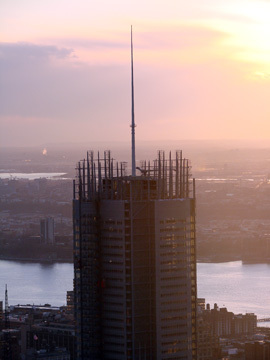 The office tower of that project was designed by David Childs of Skidmore, Owings & Merrill, who designed the mammoth new Bear Stearns & Co., Inc., tower at 383 Madison Avenue that was completed in 2001. 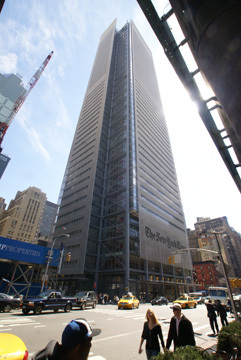 The office tower at World Wide Plaza was designed in a post-modern style that was highly reminiscent of the New York Life Insurance Company building on Madison Square Park and while it broke no new ground in terms of modern design it was very elegant and its illuminated pyramid top became a major new midtown beacon that greatly reinforced the city's long delayed and controversial efforts to reinvigorate the theater district and the Times Square area that were both very distressed. One of the most flamboyant "modern" architectural firms, Arquitectonica, has designed a large new tower nearing completion on the southeast corner of Eighth Avenue and 43rd Street, down the street from the existing headquarters building of The New York Times at 229 West 43rd Street. Times Square was named after The New York Times because of its "flat-iron" style building that anchored the south end of Times Square on the small block between 42nd and 43rd Streets and Broadway and Seventh Avenue. The media company, however, moved out of that highly ornate building and sold it and its new owners reclad it in uninspired fashion and it then went through a series of different owners interested in it mostly for its impressive signage potential. The new tower designed by Arquitectonica is clad in reflective glass of different colors that perhaps will be appropriate to the gaudiness of 42nd Street, but like many of the new Times Square towers it is rather ungainly and not terribly poetic nor inspiring. This new tower, however, promises to be very elegant and, perhaps more importantly, one of the city's very few "high-tech" buildings, perhaps the most important since Citicorp Center. The World Trade Center, demolished in the September 11, 2001 terrorist attacks, was, of course, the city's most visible "high-tech" project, and its loss makes the new tower all the more important as a spur to leading the city out of the conservative design morass it has been in for a generation, a generation marked by an explosion of great architecture around the world. In a statement about the project, Renzo Piano declared that his inspiration for it was the simplicity and clarity of the city's street grid and that he therefore wanted it to be simple and transparent: "Towers, as we know, are often symbols of arrogance and power, but this will not be our case....The building's basic shape is simple and primary, similar to the Manhattan grid. It is slender, and does not use mirrored or tinted glass which render towers mysterious and hermetic subjects. On the contrary, the use of clear glass combined with a pattern of ceramic will allow the building to adapt to the colors of the atmosphere. Blueish after a shower, shimmering red after a sunset." The building's facade is very unusual and takes its concept in part from the European tradition of sun-screens or grills. "Much of the building's double thermal-pane glass curtain wall will be screened by thin horizontal ceramic tubes placed on a steel framework positioned one to two feet in front of the glass; in other places, this screen will be made of metal and glass louvers. In addition to permitting a high-degree of energy efficiency in heating and cooling the building, the ceramic tubes will take on the changing color of the sky during the course of the day as light focuses on it from different angles. The screen and glass curtain wall will provide a sense of lightness and transparency. At the top of the building the screen of tubes will become less dense, and its lace-like appearance will permit a view of the roof garden foliage....The curtain wall will be punctuated by three-and-a-half-foot-high vision panels on each of the occupied floors, affording tenants spectacular panoramic views of the city." While the model and elevation are detailed, they do not clearly establish what this tower will look like when completed, although the architect's intentional use of clear glass is intended to make it reflective of different colors at different times of the day and from different perspectives. Its slender and excellent proportions, however, would appear to give it a classic form that will be particularly striking especially in this neighborhood of ungainly behemoths. The trellis, or lace-like, treatment of the facade indeed promise a very cool and handsome facade, and its exoskeleton should provide interesting shadow play. Renzo Piano, of course, is the "high-tech" architectural priest who, a generation ago, gave the world the Centre Georges Pompidou, or Beaubourg, in Paris, the incredible high-tech structure that is one of the monuments of 20th Century architecture. The 52-story building will have 1.54-million square feet of gross space. It will rise 748 feet from the street to its roof, but the exterior curtain wall will extend 92 feet higher to 840 feet, and a mast will extend up to 1,142 feet, considerably higher than the spire across town atop the Chrysler Building. A story about the project in The New York Times indicated that the mast will sway in the wind, although the project's press release makes no mention of that very interesting and intriguing fact. This is not a small building, although it is likely to be eventually hemmed in a bit by two other nearby developments as the parking lot on the blockfront directly to the north on the southeast corner of Eighth Avenue and 42nd Street is likely to be developed and the Port Authority of New York & New Jersey has long planned for a skyscraper to be erected above part of its sprawling terminal on the southwest corner of Eighth Avenue and 42nd Street. For decades, the Eighth Avenue corridor around the bus terminal has been one of the city's, and the country's, most unsavory and unattractive environments, a terrible gateway for bus travelers. The incredible redevelopment of 42nd Street and Times Square, after many years of expensive controversy, has radically changed much of the surrounding area although the Garment Center and the area near the Lincoln tunnel remain backwaters. This project, especially because of the prestige of The New York Times, will greatly improve the ambience around the bus terminal. Indeed, the building will be set back 17 feet from the building line to open up more pedestrian space and a low-rise wing on the eastern portion of the site will have a large garden and will be overlooked by a 350-seat amphitheater that will be available for use by non-profit civic and community organizations at least 104 nights a year. The building will be a commercial condominium in which The New York Times Company will occupy about 800,000 square feet on the second through the 28th floors and Forest City Ratner and ING Real Estate will own about 600,000 square feet on floors 29 through 50 as well as 20,000 square feet of street-level retail space. The roof garden will also have a conference facility. About 2,500 employees of the Times will work in the building, many relocted from its headquarters at 229 West 43rd Street, a sprawling mid-block structure with a handsome pyramid roof. The newspaper's newsroom will be on the second through the fourth floors of the tower. The newspaper's newsroom at 229 West 43rd Street was at one point significantly expanded into the adjacent Paramount Building when the great Paramount Theater space was converted, very sadly, to office space. Given the name of Times Square, it was very sad that The New York Times Company did not try to preserve its former landmark at the south end of Times Square and it is curious that as the most important corporate presence in the Times Square area that it it did not elect to become a major tenant in one of the many new towers that have sprung up in recent years with a higher visibility, but then, of course, it spent many, many millions building a printing plant in New Jersey some years ago. Despite such apparent corporate disregard for the neighborhood in the past, the commitment to build at this location is very important to the city and laudatory. Even more praiseworthy is the company's decision to try to forge an architecturally important new edifice. Had the company shown such leadership earlier the renaissance of Times Square might have occured sooner and perhaps with more exciting results, although there is no denying that the razzle-dazzle signage of Times Square now is fabulous and has made the architecture of the buildings less important than some critics, including this one, might have thought. Curiously, the model and elevations give little indication of "spectacular" signage but the area has enough now and perhaps the bus travelers across the street could use a little respite from the visual cacophony and onslaught of the area. The New York Times Company had conducted a design competition for this project and at one point it appeared that the commission was going to go to a joint venture of Frank O. Gehry and David Smith and some of Gehry's design for this site could be seen in the recent major retrospective on him at the Solomon R. Guggenheim Museum (see The City Review article). Those designs included a tower with a rippling, bifurcated top that were very intriguing, albeit not as elegant as this design. While it would be amusing to say "Too little, too late" about this project, that is not the case. The city has begun to witness a quite noticeable upgrading in new architectural projects and while this is not as terribly exciting and important as Gehry's proposed massive new Guggenheim Museum project proposed for south of the South Street Seaport in Lower Manhattan, it nevertheless is a very major and very good new project for Midtown West, and hopefully it will the two other nearby development sites will follow its lead with the result that the bus terminal gateway, one of the city's three major transportation hubs, will begin to be presentable, palatable and something of which the city can be proud. Renzo Piano's expansion plan for The Morgan Library was approved in early 2002 by the city's Landmarks Preservation Commission (see The City Review article). Fox & Fowle received a National Honor Award for Design from the American Institute of Architects for its design of the Condé Nast Building at 4 Times Square and they have been involved in the design of several other major towers in the Times Square district as well as elsewhere in the city. Unlike some famous architects, Fox & Fowle does not have a "signature" style, but it has consistently churned out handsome projects. Forest City Ratner Companies is an affliate of Cleveland-based Forest City Enterprises, the largest publicly traded development company in the United States and it has completed 26 commercial projects in New York City including the MetroTech center in downtown Brooklyn and it is working on the first phase of Harlem Center, a $90 million mixed-use project on 125th Street in Manhttan that is expected to open in the summer of 2002. ING Group is a global financial institution that is based in the Netherlands. In early 2007, tenants began moving into the tower, which began a major presence on Eighth Avenue but a rather drab and disappointing one.